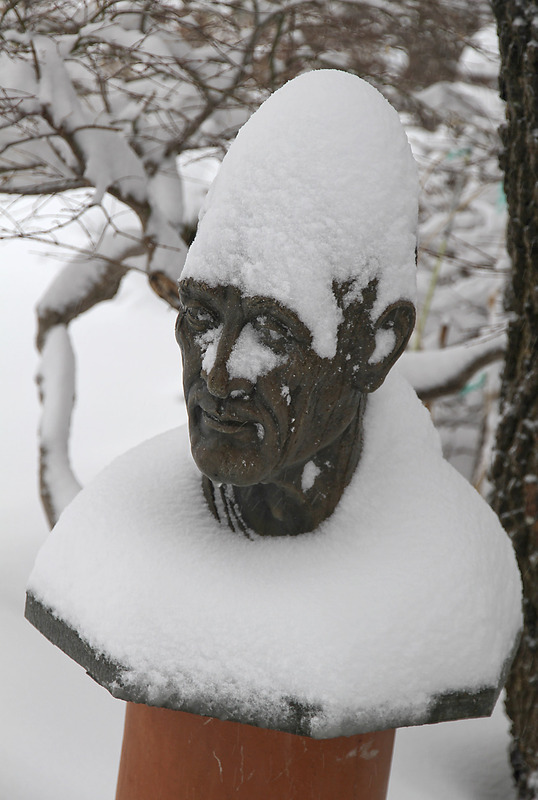 The Joys of an Early Rochester Springtime! 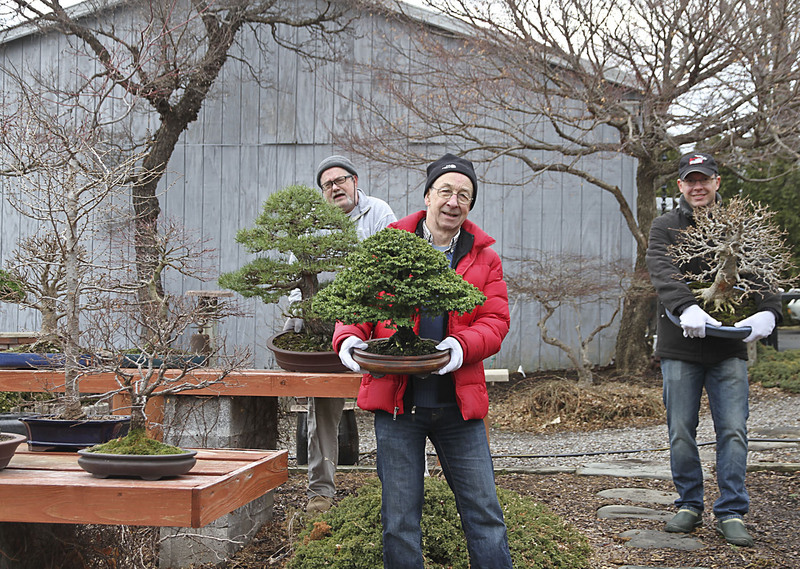 The migrant workers, Diego from Brazil and John from Ithaca volunteered to help move some of the dormant bonsai outside with Alan Adair my assistant. 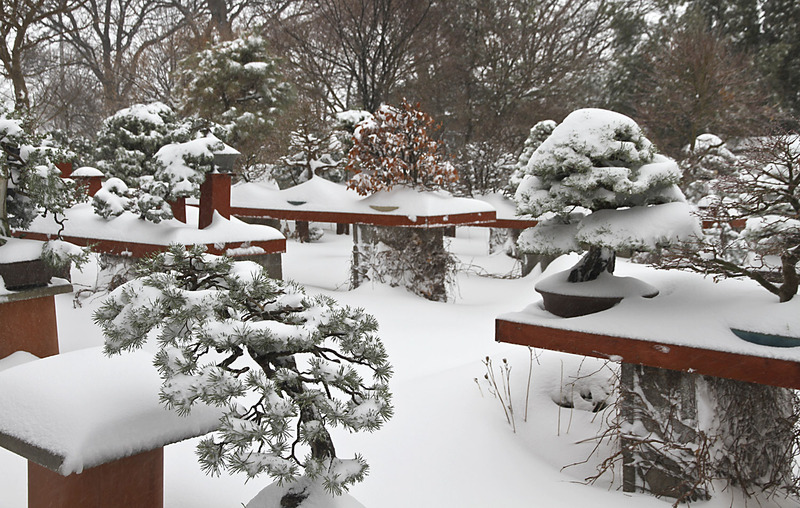 Only evergreens and deciduous bonsai with tight buds were moved. 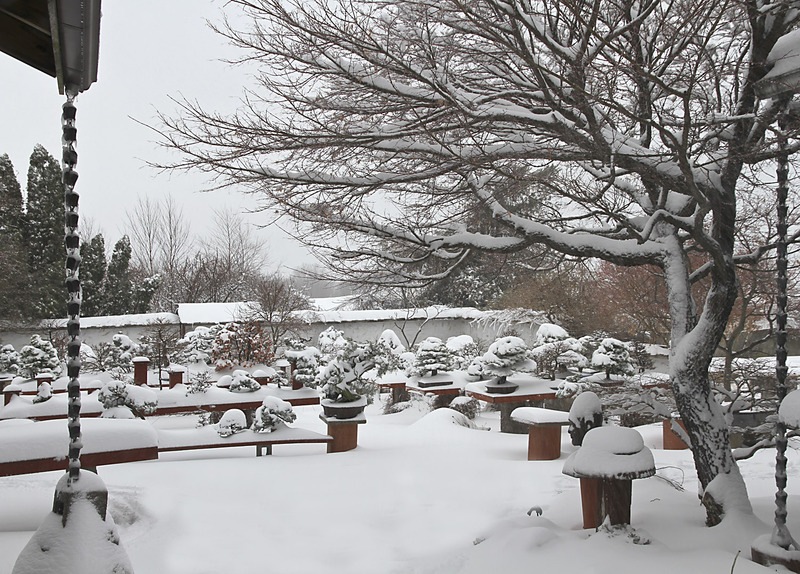 A few other friends came later on and my garden began to look more like a bonsai garden than a grey winter scene. Saturday morning my Saturday Crew came and moved all of the large and two-man, bonsai outside into the display and sales area. 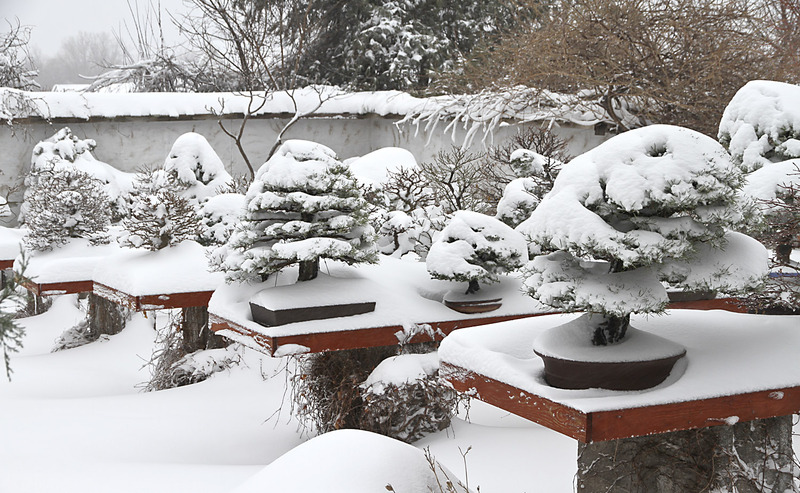 As they know, just put the trees outside, I’ll move them all later and even if I tell them exactly where I want them, I’ll still move them around. So when you look at the trees on the tables, note many are not straight and parallel with the table edge, however, I guarantee they will be straightened out at a later date. As the Saturday Crew was moving trees someone mentioned that we were in a winter storm warning. It’s a good thing they only moved trees, which were still in deep dormancy. Other trees, which had enlarged, and opening buds remained inside the poly houses. 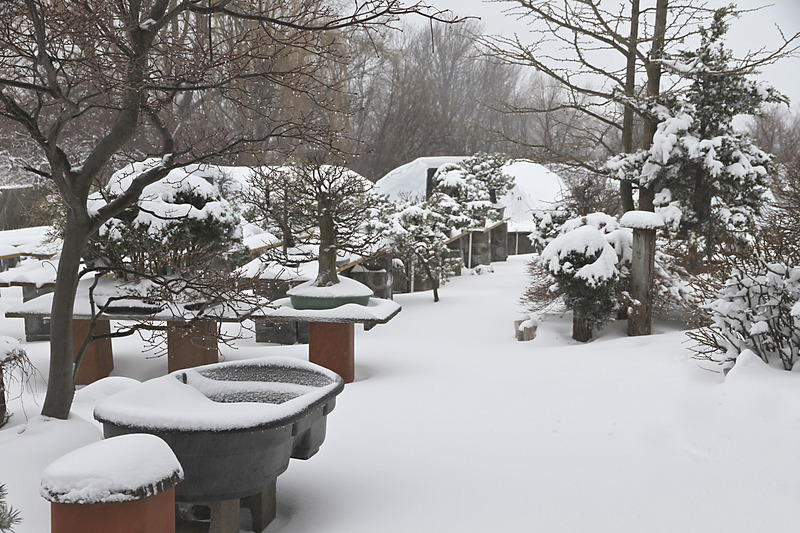 The low temperatures were only forecast to be about 29-31F. which is fine. 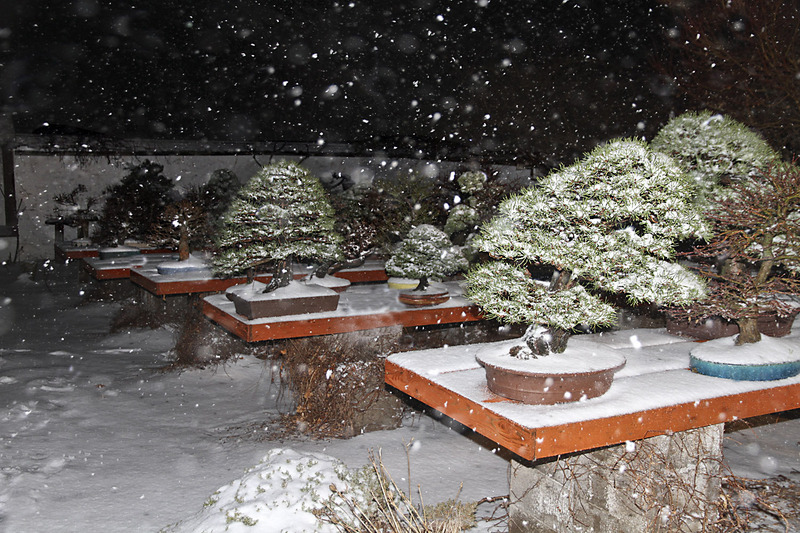 Remember, my trees have been acclimated to 27F. However, IF the temperature forecast drops to about 20F. we will be a bit busy around here moving some trees into the garage or under the tables. 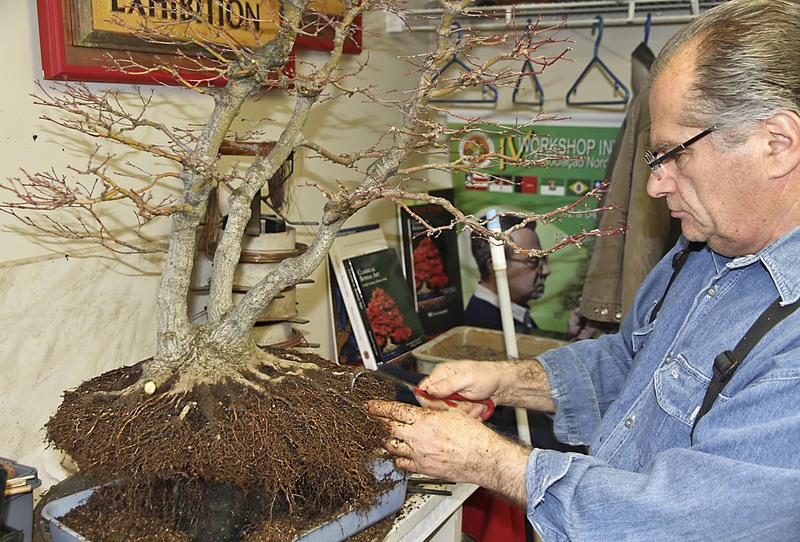 Harvey spent most of the day refining and cleaning the roots of his Japanese maple. 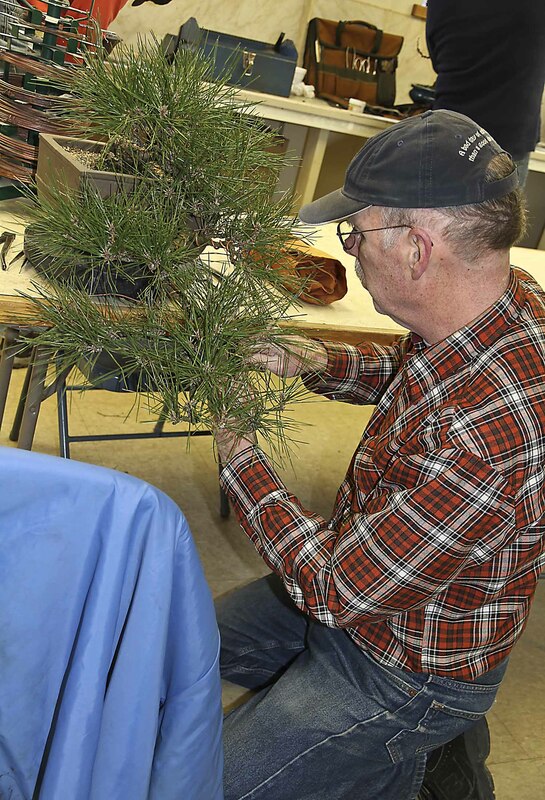 Bob Pfromm worked on a Japanese five-needle pine. 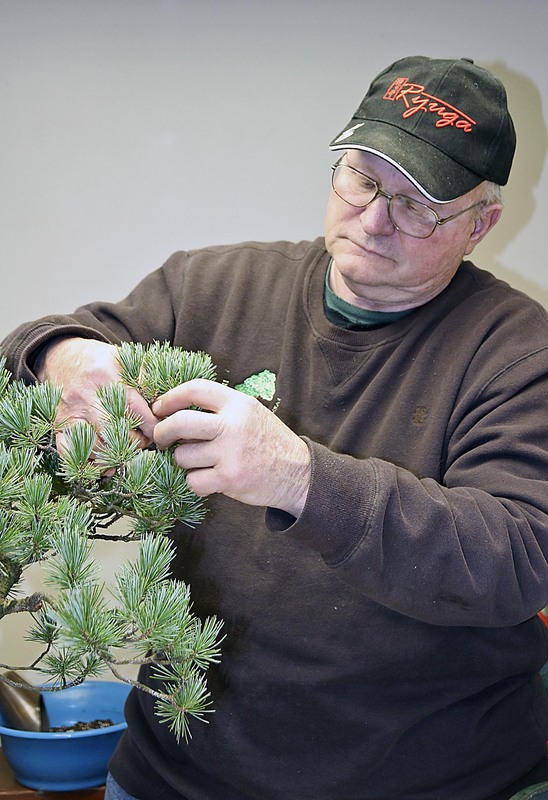 Fran Mahoney wired two Nishiki Japanese-black pines. 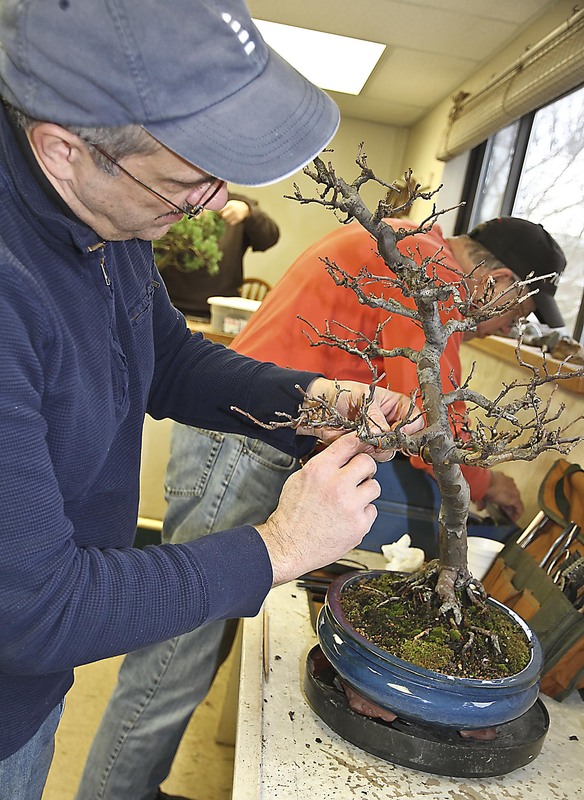 Jim Dolce worked on a Chinese quince. 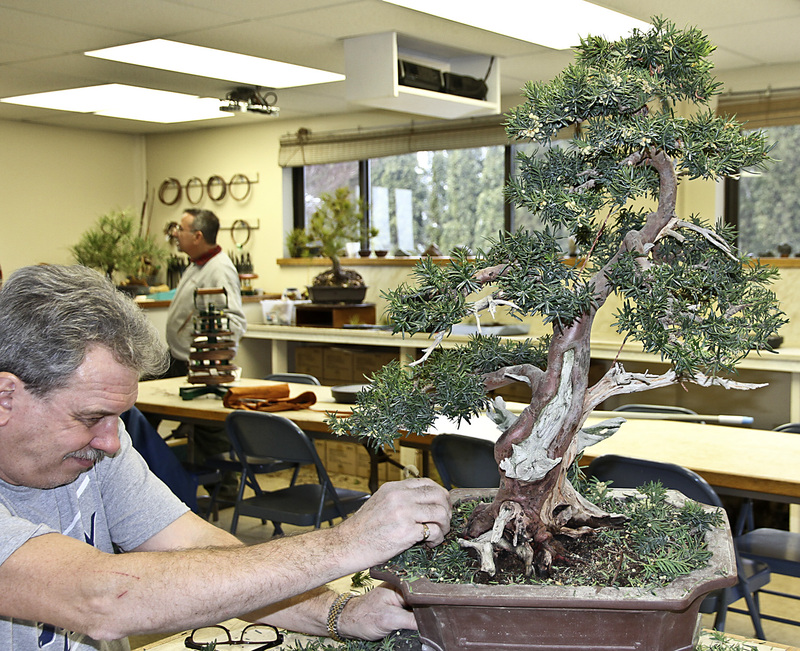 Bob Blankfield worked on a Japanese yew. 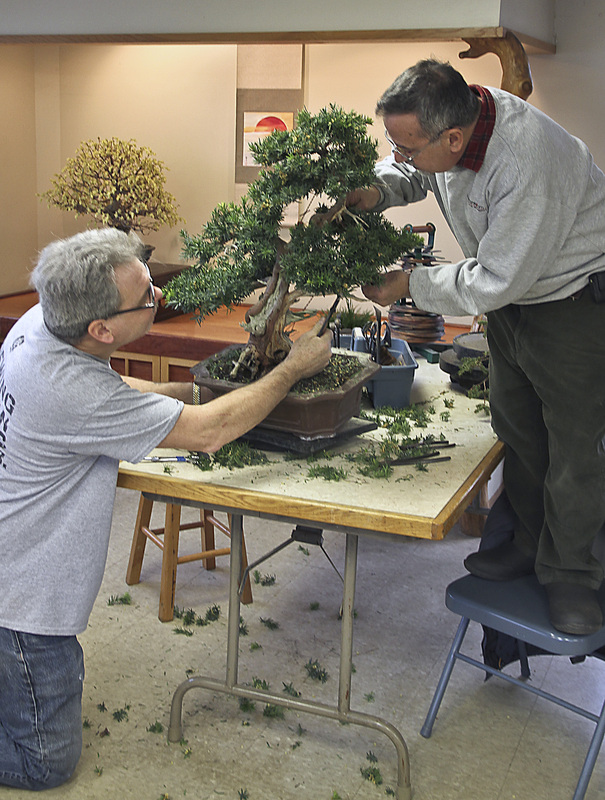 It took both of us pushing hard to compact the top section of the bonsai using three guy wires, but we did it! 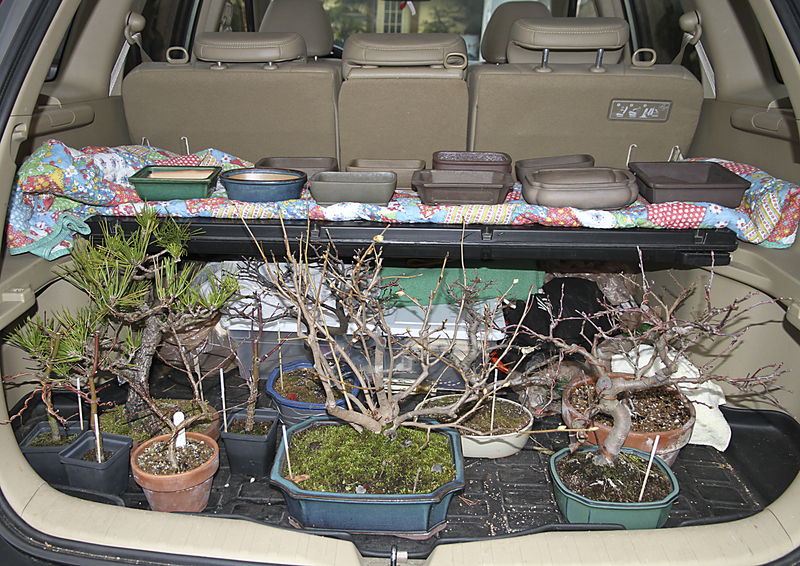 Rick Marriott likes small size bonsai and always brings a load of tree and selection of containers. My two Open Workshops finished at 4pm on Saturday. After cleaning a bit and checking my e-mails I was so exhausted from teaching 11 classes in five days I simply went to bed at 6pm. 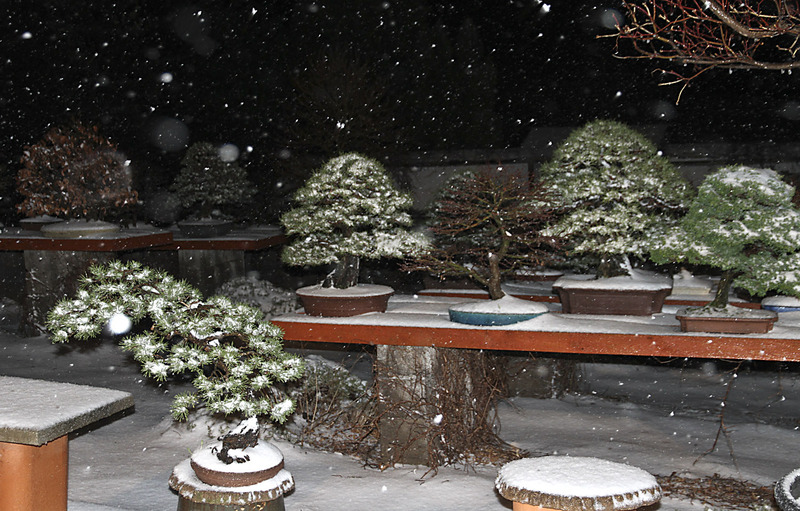 I woke up at 9pm (don’t need much sleep) to find freezing rain and snow coming down quite hard. Got dressed, took my camera and went outside into to check the trees and to take a few photos. Then I went to bed, again after having a quick bowl of Sapporo Ichiban noodles. Sunday morning I woke up to a “Winter Wonderland” and took a few more photos. 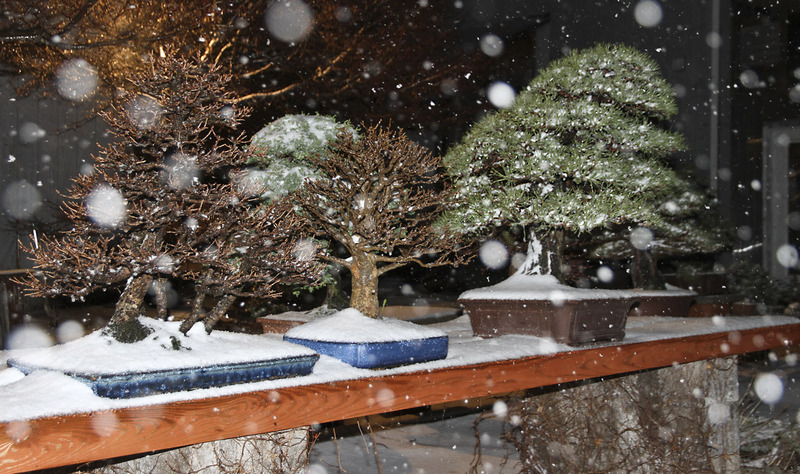 I agree the trees look beautiful in a fresh snow covering, but I hate snow and really only like it on Xmas cards. 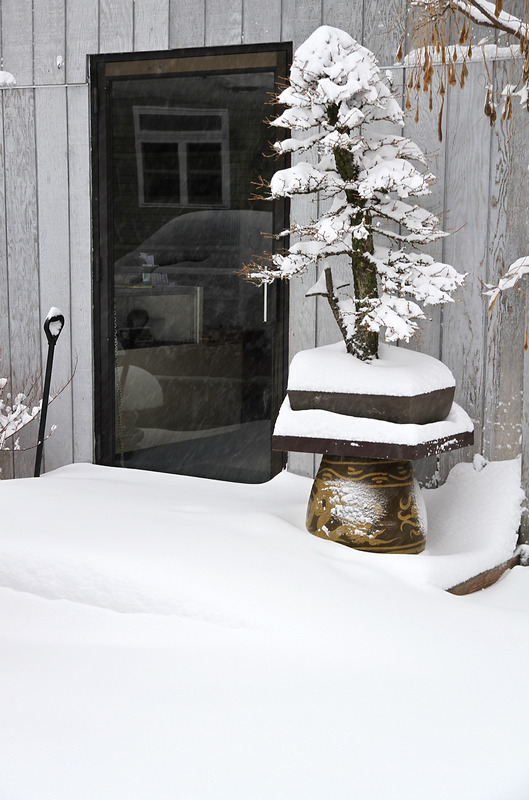 We had at least 9″ of HEAVY wet snow and deeper drifts. 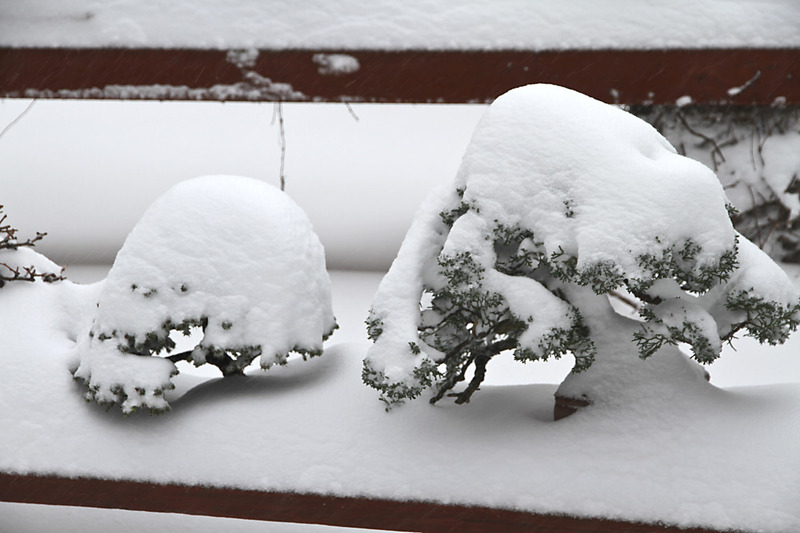 Wet snow is about three times as heavy as common snow. People often ask why I live in Rochester with the “interesting” weather. Well, I have made many close friends here during the past 46 years, and I’ve trained numerous students as well. 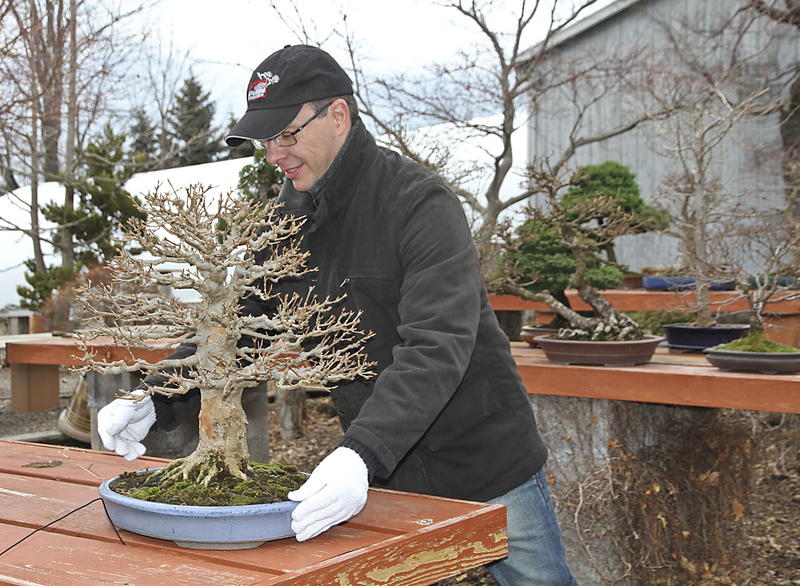 It would be impossible for me to promote bonsai, in my style, without their dedicated support. 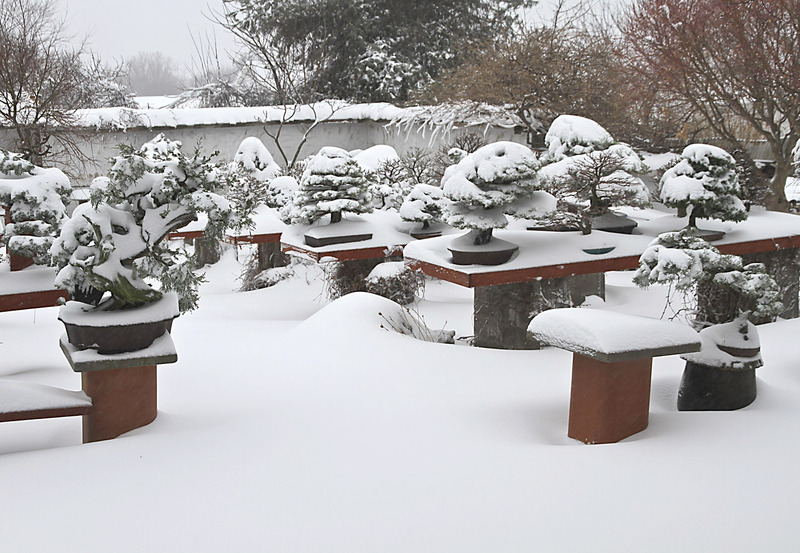 Also, if one purchases a bonsai from me, you are pretty sure it will be winter hardy in your area, if you live south of the North Pole. I am anxiously awaiting better weather, hopefully, this week. 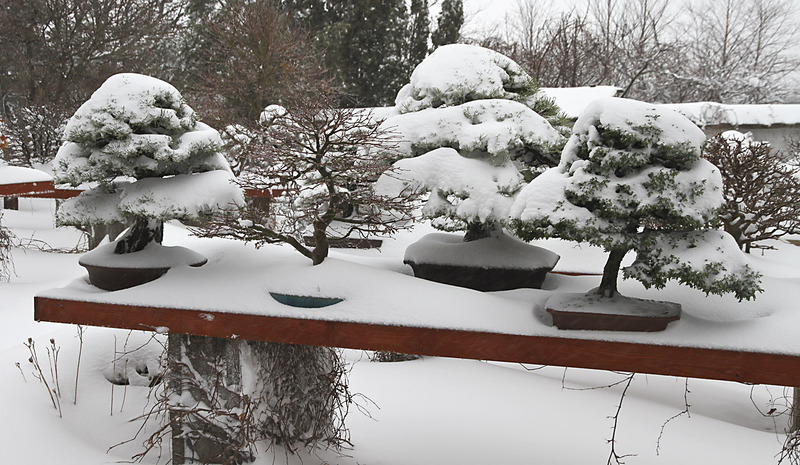 There are many bonsai to be trimmed and repotted and I have a couple of special new creations in the works, especially one in an unusually long container.